Thanks to our sponsors at Sub Zero and Wolf Appliances for their continuing support of Bekins Cooking School. These select recipes, from their website, feature everything you need to complete a traditional holiday dinner. Cooking on charcoal offers many rewards for the outdoor grilling aficionado. The subtly smoky flavor complements most foods, from sweet to savory, and cannot be matched by other fuels. Plus, there is a certain primal satisfaction in cooking over a hardwood fire that transcends the taste of the food alone. Building a good charcoal fire and controlling the temperature requires just a bit of skill that is learned easily. 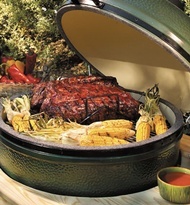 This video shows you how to get started with your Big Green Egg ceramic grill. Our cooking school chefs are also offering free Big Green Egg grilling clinics this summer at our Grand Rapids showroom. As we roll into summer in Michigan, one of the signs we look for is firing up the grill! Yes, the diehards have been grilling all along, but if you are like most people, you prefer to grill in somewhat warmer temps. Now is the time to take note of what you have and gather what you will soon need to make 2012 memories in your outdoor kitchen – whatever size it may be. With new gadgets continually hitting the market, it is easy to turn to this way of cooking throughout the year. Pizza, fish, vegetables and lobster tails, for example, show the flexibility of this outdoor appliance and entice us all to get more creative in our backyards. As cooking shows embrace the grilling craze as well, grills are used for every course of meal including desserts. The web hots a plethora of recipes, tips and techniques. If you find you are ready to take your grilling skills to the next level, sign up for some grilling classes. Maybe a new grill is in order too. Take your time and invest wisely and really understand what you need to make sure the new grill fits your criteria. The fun of grilling becomes disheartening though when you find you do not have the proper tools and gadgets or that you have no idea what happened to them since last fall. Here are some tips to keep grilling enjoyable and organized throughout the entire year. In the kitchen prep area: Keep a basket or container of the spices, rubs and marinades often used. Having this go-to spot will make it easy to keep an eye on levels so you know when to stock up again. Keep a basket or container with the grilling tools and gadgets ready to go so you don’t forget something when food is half done. Normally these things do not fit in your standard kitchen drawers so dedicating the appropriate space will enhance your grilling experience. This will also minimize the running in and out to retrieve forgotten things. Make sure the basket is long enough to handle the tongs, spatula, mitts/gloves, meat thermometer and other gadgets so they all go out in the same trip. In the grilling area, dedicate a flat surface or table to set your basket of tools and gadgets on, trays of food to be grilled and trays of cooked food for immediate enjoyment. Having this table will make before and after grilling easy for preparing and serving, as well as clean up. If the grill itself offers storage, keep it well stocked with items like the grill brush, grill wipes, oil, aluminum foil and paper towel along with extra mitts. Depending on space, there may be room for storing the pizza stone, vertical chicken roaster, smoking chips, and wood planks. Keep a spare, filled propane tank or bags of charcoal on hand. Keep beverages and paper products in another area so guests do not invade your grilling space. Keep your area clean and organized at all times so the cleanup is quick and simple. Jennifer Devries is a Kitchen Outfitter with Bekins and a member of the National Kitchen and Bath Association (NKBA).